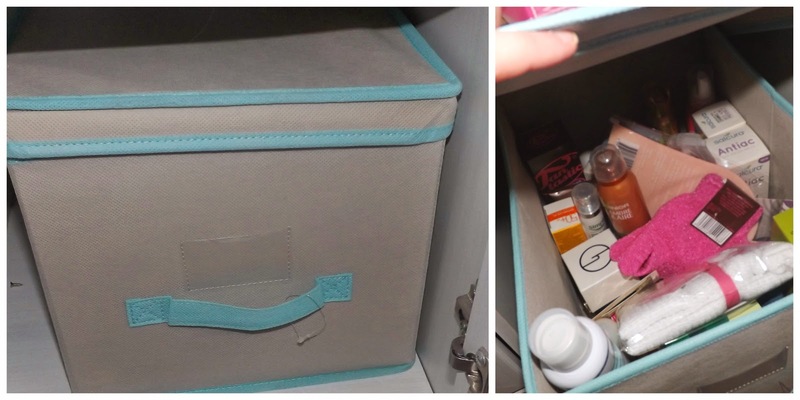 NEAT storage solutions: Review & Giveaway! I'm going to confess something to you all today....something pretty embarrassing. A messy, unorganised, scatter-brained hoarder. But I somehow manage to accumulate a lot of "stuff" very quickly, and it always ends up being shoved into "THAT" cupboard out of sight. But the other side of the wardrobe - where I keep my make-up, smellies, skin products, nail products etc - had become a living nightmare! As you can see....there was no organisation going on at all. But among all of this chaos were essential items such as my everyday make up, my hairdryer, and my tweezers - things I need to access often. And trying to find them among this chaos was becoming a nightmare! 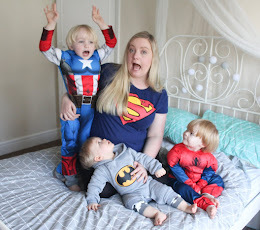 So when I was recently offered the chance to review the NEAT storage range from Ideal World - I knew I was going to use to try to bring some order to this cupboard once and for all! The range consists of lots of handy fabric boxes and bags, some with lids and some without, some that you can hang up and some that sit on shelves - they are cream and a mint-sort of colour and very attractive to look at. There's no assembly required, you just open them out and pop in the sturdy base. So what difference have they made to my Cupboard of Doom? Well, here's how it looks now. Doesn't it look so much better?!!! You'd be forgiven for thinking that I'd thrown loads of stuff away, but I didn't! 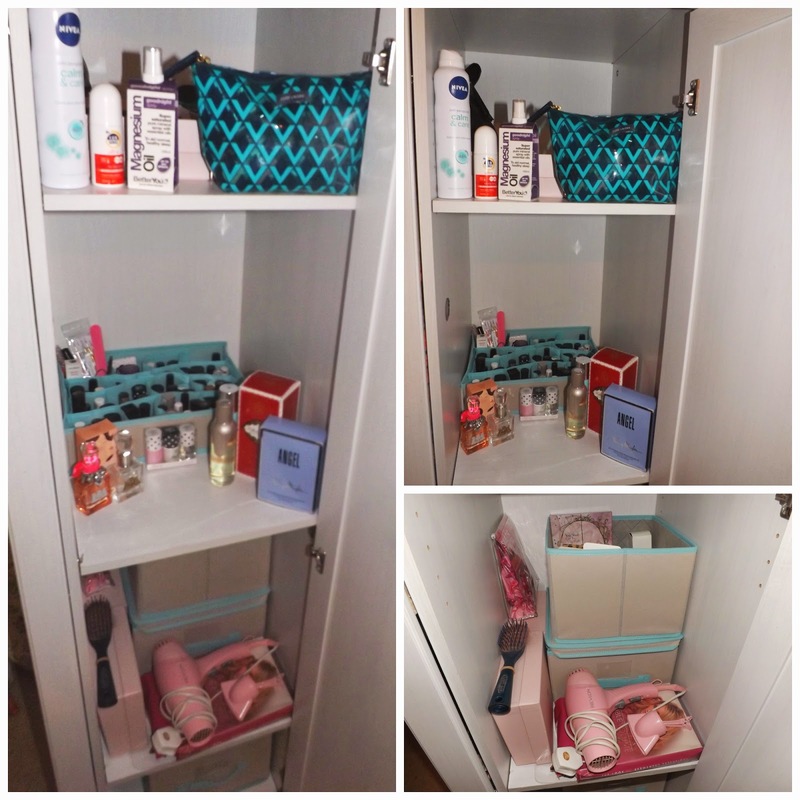 Apart from 1 or 2 tatty looking lipglosses, everything that came out of that cupboard has gone back into it...but thanks to these super handy boxes it all looks so much neater and is so much more organised! I now have a "theme" for each compartment. 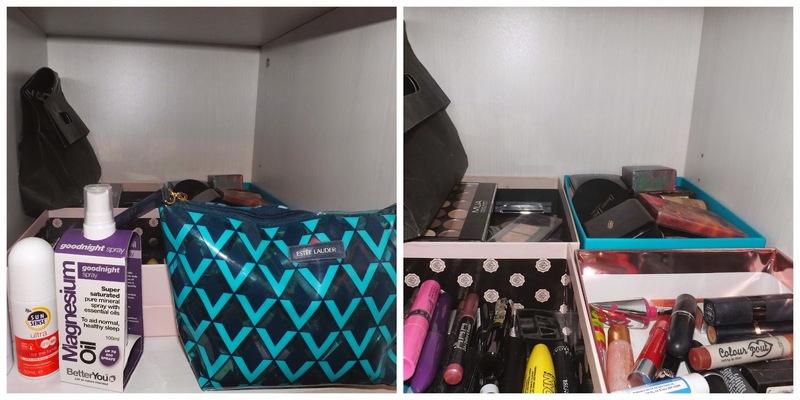 The top compartment is for Make up and daily use items. I used four glossy boxes, 1 is full of face make up products such as foundation and blusher. 1 is full of eye shadows (considering I wear the same one every day, who knew I had enough to fill a whole glossy box?! ), one is for other eye make up (Apparently I have 12 unopened mascaras?!) and the fourth & final one is for lip products. I also have my MAC bag in there which I keep my MAC empties in for the Back To Mac recycling scheme. At the front I have my magnesium sleep spray, my Sun cream which I use everyday for Tyne, and my daily use makeup bag with my every day make up inside. The second compartment is my favourite! It has my perfumes - right there at arms reach, no more fumbling around blindly and wearing the first one I find! And I used one of the NEAT boxes to store my Nail varnishes! 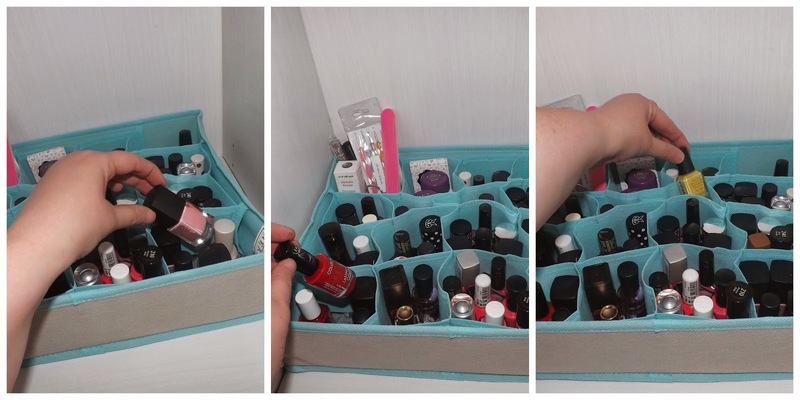 Now I think this box is probably meant for storing ties or socks, but I think its ideal for separating nail polishes! I used to keep mine in a glossy box but they often got damaged that way, and it was a nightmare rooting through them trying to find a nice colour to match an outfit. 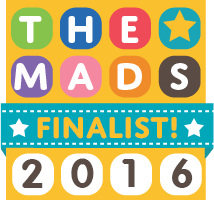 Now I have them grouped into colour categories! Each compartment in this box holds a different colour - for example all of my reds are together, all my hot pinks are together, all my glitter polishes are together, etc! Now I can just look at my outfit, decide what colour would go and go straight to that section to choose the one I want! LOVE it! The third compartment is for hair & face products. bottom so the one without a lid sits comfortably and steadily on top! The box with the lid is full of hair products - hairsprays, mousses, dry shampoos, spare hairbrushes, etc. 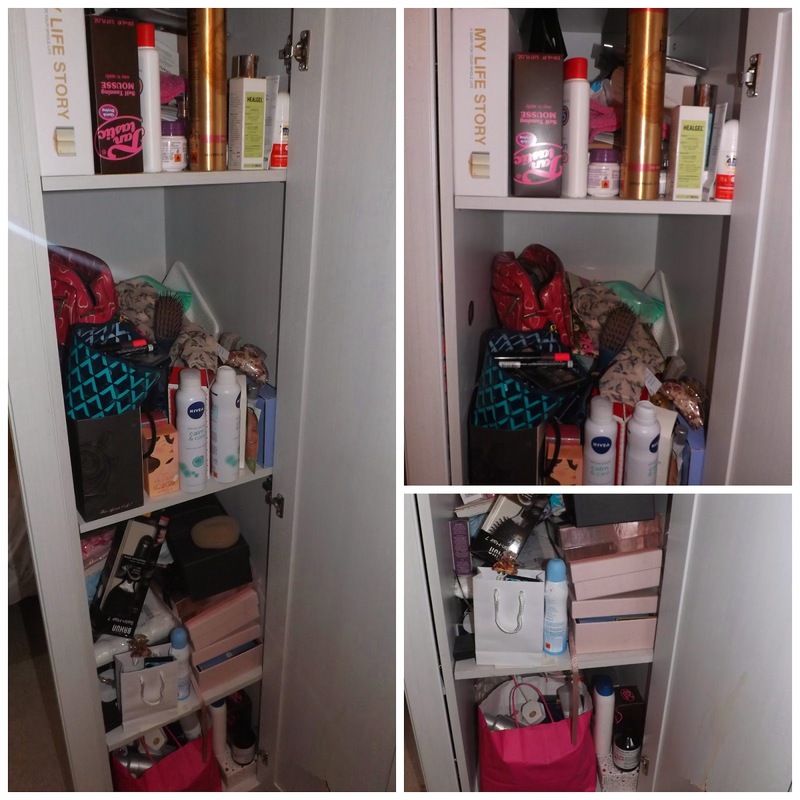 The open box on top is full of face products such as creams, make up remover wipes, make up brushes, etc. I also have two glossy boxes in there - one which is holding my fake-hair buns, and one holding hair accessories such as bobbles and clips. I also have my favourite hairbrush, my hairdryer and my extensions and shower cap in there ready to grab when I need them. The fourth and final compartment is home to one large NEAT box. It is full of all my body products - fake tans, exfoliating gloves, creams, etc. So there we have it! With just half an hour spent and the addition of some super handy NEAT storage boxes I managed to transform my Cupboard Of Doom into an organised and much prettier space! To celebrate the launch of NEAT with Anthea Turner, we are giving away a full storage kit from the NEAT range signed by Anthea herself! Launching on 2nd July and available to buy exclusively from Britain’s largest home-grown TV shopping network Ideal World TV and online at Idealworld.tv, NEAT combines style and functionality to give customers a range of products that not only look great but are also full to the brim with smart features to make life easier. The collection includes wardrobe and drawer storage solutions, hangers, zip boxes and baskets, with each product cleverly creating a smart storage solution. Whether seeking a solution for the mountain of shoes in your bedroom – our clear zip boxes are the answer! Or storing away your winter clothes, NEAT offers a solution for all your storage dilemmas. Anthea Turner will be appearing on Ideal World TV on 2nd and 3rd of July at 8pm to showcase the products. To be in with a chance of winning the full NEAT storage set signed by Anthea Turner, just complete the Rafflecopter form below. Would love this for my new kitchen. Getting installed 21/7/14 and cannot wait!